The business case for private sector investments in climate solutions. Infographic by Acclimatise Ltd. Businesses know that to be successful, they must adapt to constantly changing market conditions, and that changes can stem from economic, social or environmental factors. The impacts of climate change are already being experienced by businesses, and many see a clear commercial rationale in terms of managing risks and harnessing opportunities. The process of transformation to a resilient economy brings new opportunities for businesses, including new products and services, new and expanded markets, cost savings, building more resilient supply chains and creating reputational benefits, all of which provide returns on investment and a positive impact on the bottom line. New sources of finance are available to support investment in these new markets, products and services, including the Green Climate Fund (GCF), which has a specific focus on the private sector. This paper* is aimed at members of the Bangladeshi private sector, and was developed based on consultation with in-country stakeholders. It outlines the case for action on climate change by the private sector, including the direct and indirect impacts of climate change on business (see Figure 1 below), and specifically, what opportunities are available for businesses to harness as a result of climate change including access to new sources of finance. The report provides a snapshot of the available opportunities focusing on four sectors: energy, agriculture, insurance and banking/finance, including examples of companies at the forefront in developing new products and services and creating new markets in response to climate change. It concludes with guidance for businesses’ next steps in accessing the opportunities available to them now. *download the full text from the right-hand column. The key messages are provided below. 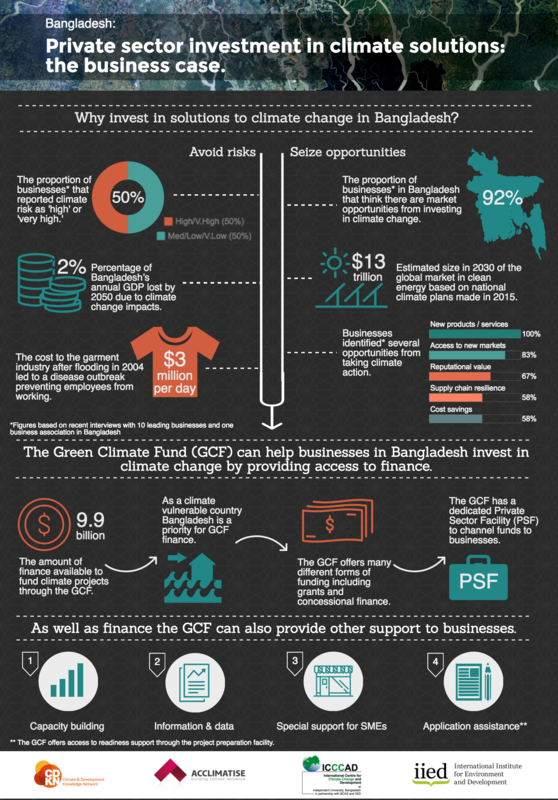 10 key takeaway messages for businesses in Bangladesh can be found on page 5 of the report. Climate change presents both risks and opportunities to the private sector. It acts as a stressor to existing risks and impacts business objectives and priorities, presenting a window of opportunity to take action on issues and areas that are already important to a business, such as water stress, logistical response to extreme weather events and waste management. Furthermore, climate change creates the opportunity to develop new products and services, expand and access new markets, benefit from cost savings, protect supply chains and build reputational benefits. Bangladeshi businesses are already benefiting from climate related opportunities, for example by developing and marketing climate resilient seeds or by developing a new market for solar home systems. Businesses face challenges in scaling up their climate-related initiatives and seizing further opportunities despite recognizing the significant opportunities available due to climate change. The Green Climate Fund can help address the barriers that businesses face and help them harness opportunities, specifically through its Private Sector Facility (PSF), a dedicated financial window to mobilise and channel private capital and expertise at scale. Opportunities can be harnessed by building partnerships with other businesses, associations, NGOs, government agencies and development partners to take advantage of the resources, networks and expertise provided by each. International development partners in particular have the resources to help create and finance market opportunities.